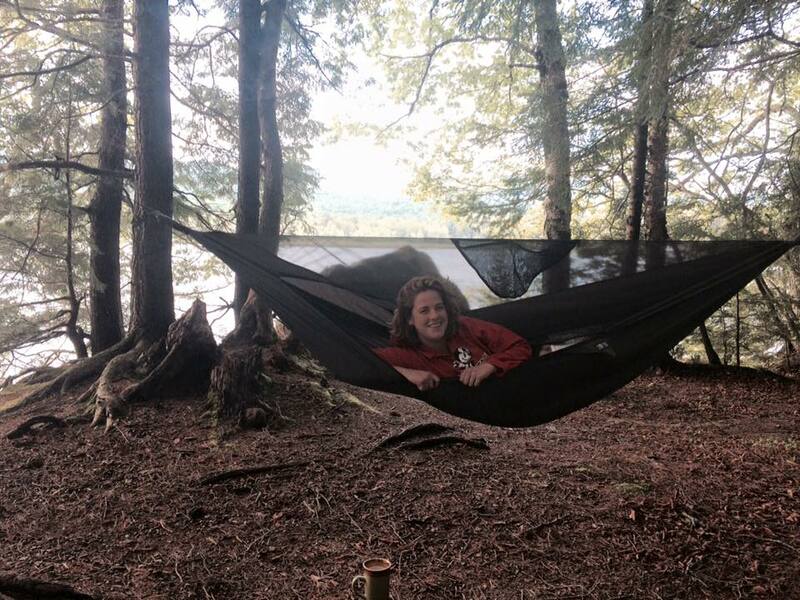 Hammocking at a campsite in the Adirondacks. This past spring, I ordered a Hennessy Hammock Hyperlite Asym Zip. My job as a ridge runner in Connecticut and Massachusetts has me camping on the trail more nights that not. I previously used an ENO hammock, but I wanted to upgrade to a better backpacking setup. I feel like I’m sleeping in a cocoon of comfort. I seriously don’t want to get out of my hammock in the morning. Sleeping in shelters or in a tent just isn’t the same after being a hammock-er. My hips usually ache when I have to sleep on the ground, but being suspended in the air alleviates that pain. I roll around a lot while I sleep. I usually go back and forth between sleeping on my sides and back. The Hennessy is stable enough that I can reposition myself over and over again without getting tangled or lopsided. I love the bug net zipper feature. The hammock is super easy to get in and out of because of the zipper. I also get a sense of satisfaction hearing the mosquitos buzzing around just outside and not being able to get in. The hammock is very minimalistic and light-weight. The Hyperlite Asym Zip that I own is a few ounces shy of two pounds, so it has significantly contributed to lowering my overall base weight. The only “extra” thing on the hammock is a pouch that hangs off of the ridge line on the inside. I have found the pouch to be useful, and I usually put my cell phone, head lamp, and Kindle inside of it for easy access. Other that that, the hammock has no frills or excess parts to make it heavier than it needs to be. It does take a few times of setting up the hammock to get used to it, but after that it’s really easy. On the AT, there is no shortage of trees to choose from. I can always find a couple of evenly spaced trees that are the right size. My nephew wanted to test it out for me. Where do you put your pack when it rains? Typically, on nights when it doesn’t rain, I just leave my pack lying under my hammock. When it does rain, I do one of two things. I put the pack cover on, then lay the pack under my tarp when the cover side down. Or I just put the pack in my hammock with me, under my knees. Either one works well. The hammock is actually roomier that you would think, so having the pack inside with you is not a big deal. Isn’t it hard to set the hammock up? It is not very difficult actually, once you get used to it. Just follow the instructions that are printed on the stuff sack, and you’re golden. In regards to tying the ropes to the trees, I use the lashing technique that they suggest on the website. It holds really well. I once tried to use knots instead, and after I laid in the hammock the knots became so tight it took me a very long time to undo them. I’ve also seen people use carabiners with their webbing straps, so that is an option. Doesn’t it feel cramped? No, not really. I did have to get used to keeping most of my non-sleeping gear in my pack at night, as opposed to having a pack explosion inside of my tent. I’m OK with that though. It feels more minimalistic. Also, like I said above, there is a small pouch hanging inside of the hammock where I can store a few items while I sleep. Does it get cold at night? The wind does blow underneath of you, thus taking away the insulation benefits of sleeping on the ground. In the warmer months, this is still totally manageable . I sleep with my foam Thermarest underneath of me, and that keeps me warm at night. Hennessy also offers their own hammock specific insulation options. Hennesy Hammocks are a great option if you’re looking to upgrade your current system, find something more comfortable, or lighten your pack. Were you by any chance at Glen Brook Campsite last night? I met a female ridge runner there. I haven’t stayed there for a few weeks. It was probably one of my coworkers though! My wife and I love our Hennessy’s as well. Set up is a breeze with Whoopee Slings too.